Get The Facts About Flax Seed! For years, rice bran has been the go-to supplement for adding calories to horse’s diets. Like many fat sources, rice bran should be stabilized to keep the product from going rancid. Rice bran also happens to be an ingredient with a reversed calcium and phosphorus ratio, but typically, not enough is fed to have a significant impact. 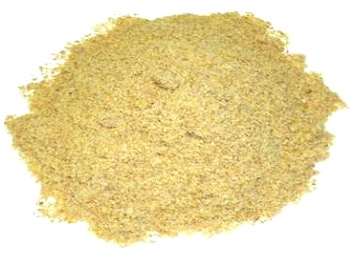 Some rice bran products on the market today have added calcium to balance the ratio. Rice bran however is an ingredient with higher Omega-6 to Omega-3 levels, actually as high as 29:1 and this is why you may want to consider flax for calories instead. Flax has also been used by many horse owners as a supplement to the horse’s diet to help with hair and hoof condition. It was not commonly thought of as a fat supplement. However, there are many good reasons to add flax seed to your horses diet. The total fat content is much higher in flax seed than rice bran. A typical analysis for flax seed is around 30-40% fat and 20% protein. The major benefit of flax is that it provides higher levels of Omega-3 fatty acids. A typical ratio of Omega-6 to Omega-3’s in flax is 1:4. Compare that ratio to rice bran listed above. How can this higher Omega-3 ratio be beneficial? More Omega-3’s in the diet can provide anti-inflammatory responses and improve overall immunity. These benefits could mean a positive effect to circulation and joints as well as skin, hair and hoof condition. While additional research is needed in the study of omega’s, it is possible that the supplementation of Omega-3’s can help with skin allergies, respiratory inflammation, reproduction and inflammation associated with exercise and performance. While the primary source of Omega-3 fatty acids for horses is from fresh pasture grass, not all horses have the luxury of grazing 24/7 and seasonal changes can also mean no pasture available to horses come winter time. With many horses now eating some form of a concentrate, these feed sources tend to have a wider ratio of Omega-3 to Omega-6 than desired. Research has not yet determined the proper ratio of Omega-3 to Omega-6 in a horses diet. Supplementing the diet with flax seed is a good way to increase those Omega-3 levels while providing calories and more fiber at the same time. Triple Crown has had a ground flax product on the market for a few years. 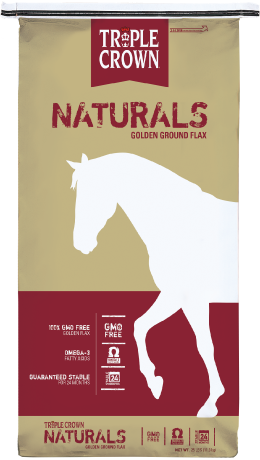 Formerly named, Omega MAX®, it has now been added to the Naturals line and renamed Naturals Golden Ground Flax. Naturals Golden Ground Flax is not stabilized by common methods of a cooking/heating process but is stable due to the way seeds are sorted and cold-sliced which allows for a 2-year shelf life. You do not have to spend time grinding down whole flax before each feeding which makes this product very user friendly. In addition, the retail price is very favorable considering a total higher fat level and the substantially higher Omega-3’s. For more information on Triple Crown Naturals Golden Ground Flax, email us or call us at 800-451-9916. You can order this product from our website here!